Let’s chat about subscription boxes, shall we? A couple weeks ago, I shared a list of beauty subscription boxes that ship to Canada. In my research, I discovered a bunch of coffee subscriptions too. I kept note of them since I’m a crazy coffee lover and cannot live without my daily cups! I had no idea there were so many Canadian companies out there doing this! The beauty subscriptions were mostly American who also shipped to Canada. These coffee subscription boxes are mostly Canadian. Many have free shipping and prices in Canadian dollars. Some are exclusive to Canada as well. As you can see prices and plans vary. If you’re in the market for a coffee subscription for yourself, take a look at all the variables including cost, shipping methods, products, frequency, etc. I love fresh coffee beans and am trying to decide which one I want. Who knows maybe I’ll end up getting a couple. I never want to run out of coffee. The selection at our local stores is pitiful. I need me some good coffee, people! 1. Bean Box ($20 USD/month, $9.50 shipping): Freshly roasted Seattle coffee. Check out my post about Bean Box. 2. 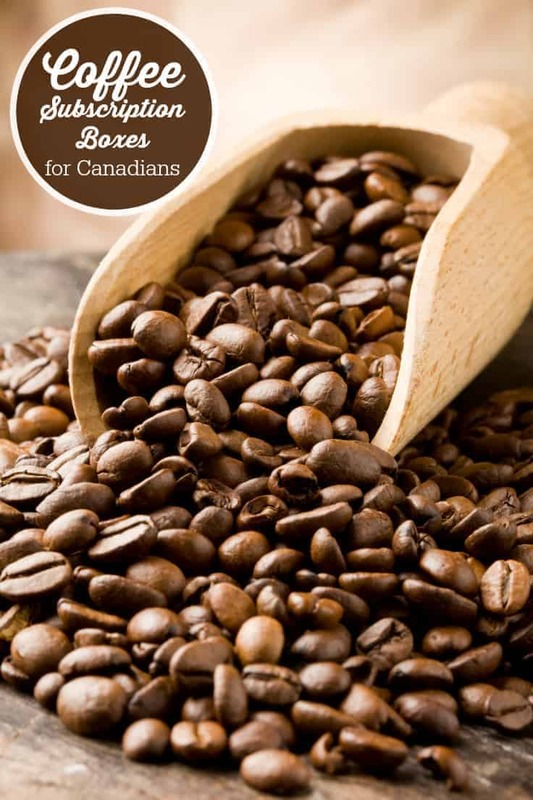 Coast to Coast Coffee ($17.95 CAD/month, free shipping): Organic, fair trade and freshly roasted coffee. 3. Craft Coffee ($24.99 USD/month, $7.99 shipping): Quality coffee from three different roasters every month. 4. Sudden Coffee ($22 to $42 USD/month): Crystallized coffee. 5. Parachute Coffee ($25 CAD/month, free shipping): 12 oz. of locally roasted whole bean coffee, tasting notes and tips. 6. The Roasters Pack ($29.95 CAD/month, free shipping): Three 4oz. pouches of coffee beans either ground or whole bean, tasting notes, etc. 8. Detour Coffee ($36.50 to $38.50 CAD/per delivery, free shipping): Get two 300g bags of Detour coffee delivered and you decide the frequency (1 to 4 weeks). 9. Phil & Sebastian ($29.05 CDN, including shipping): Freshly roasted by the Bow River in Calgary, AB. Ethically sourced and shipped weekly, bi-weekly or monthly. Have you ever purchased a coffee subscription for yourself or someone else? Stacie is the mom of two girls and lives in Ontario, Canada. She enjoys cooking/baking, photography, reading, DIY and is fueled by lots of coffee! I’ve never been one for coffee subscriptions but I also never realized there were so many! Hi! My name is Stephanie and I’m addicted to coffee. Thanks for sharing!! I have never signed up for subscription coffee boxes. Did not realize that were somany! Would be a great way to try and sample different kinds! Subscriptions for everything! Coffee would be interesting…. Interesting, I didn’t know there were any coffee subscriptions! I would like to try one out but I’m hesitant because they’re all kind of pricey..
Hi Sonya….we offer great coffees for a fair price. We are priced similarly (if not cheaper) than many other Organic, Fair Trade coffees out there. We also ship our coffee out the same day its roasted, so you will receive it within days of its roast date. Wow, who would of thought there was that many coffee subscription boxes! Love my coffee! I am addicted to Kona coffee and ever since I tried in Hawaii 30 years ago I order it in and it’s one of the most expensive but I don’t care it’s so good, I keep my addiction going betweein TIm’s and Kona, never tried a club where they automatically come, maybe I should. Oh wow! I didn’t know either that there was so many selections – this would also make a great gift idea ! I had one yrs. ago but found we had too much coffee and stopped it. Too Bad I liked the coffee. Wow! So many to choose from! I’m all about coffee, so this is like Christmas for me! Thanks for sharing! Wow! I didn’t know that all of these were available. Great gift idea! Does anyone know if there is a subscription for k-cup users? What about fair trade coffee subscriptions? I used one site for gift giving to friends interested in economic justice for coffee growers – but there were too many problems with that site. Any suggestions for fair trade coffees? any k-cup coffee subscriptions in canada? I’m not aware of any unfortunately! Is there another page? Or did someone not drink enough coffee? LOL! I always need more coffee. There was originally 12 back in 2015, but some went out of business so I deleted the links. I need to update it with a new photo and title. Success! Now check your email to confirm your subscription and get your free e-cookbook, Tasty Chicken Recipes. ©2019 Simply Stacie. All rights reserved.